Featuring a 12MP Sony CMOS sensor, the white SJ5000X Elite is the first action camera from SJCAM to support UHD 4K (3840 x 2160) video at 24 fps and 2.5K (2560 x 1440) at 30 fps. It also adds a built-in gyroscope sensor for anti-shake digital image stabilization, and a larger 2" rear LCD screen for easier shot monitoring and playback. The camera is also Wi-Fi enabled, so you can remotely control, monitor, and transfers files using an iOS or Android devices. Included is a waterproof housing with a 98'-depth rating and an assortment of mounts, includes solutions for helmets, handlebars, backpacks, and more. In addition to 4K and 2.5K video recording, the camera supports 1080p video up to 60 fps and 720p video up to 120 fps for slow-motion playback. It can also take up to 12MP still images. The camera is powered using an included rechargeable 900mAh battery pack that provides up to 80 minutes of continuous 1080p video recording. The camera can also be powered externally via a micro-USB port and can automatically power on when it detects the external power source. This feature is useful for dash cam applications when paired with an optional 12 VDC car power adapter. Dash cam use is further bolstered thanks to a loop recording mode and built-in motion-activated recording. Note: UHD 4K resolution video is interpolated from 2880 x 2160. Box Dimensions (LxWxH) 10.55 x 5.25 x 2.85"
SJ5000X Elite 4K Action Camera (White) is rated 4.2 out of 5 by 42. Rated 4 out of 5 by Anonymous from Cheap Alternative for a Gopro For a camera like this, I would recommend it to someone who is new to action cameras. It's definitely a cheaper alternative versus a gopro. I'm happy with what I got since I probably use it maybe once or twice and for vacations where I know I don't want to bring a heavy duty dslr to get quick easy shots. For the price I think it's well worth since it does what it needs to. I've tested it when driving to work and the quality is pretty good. 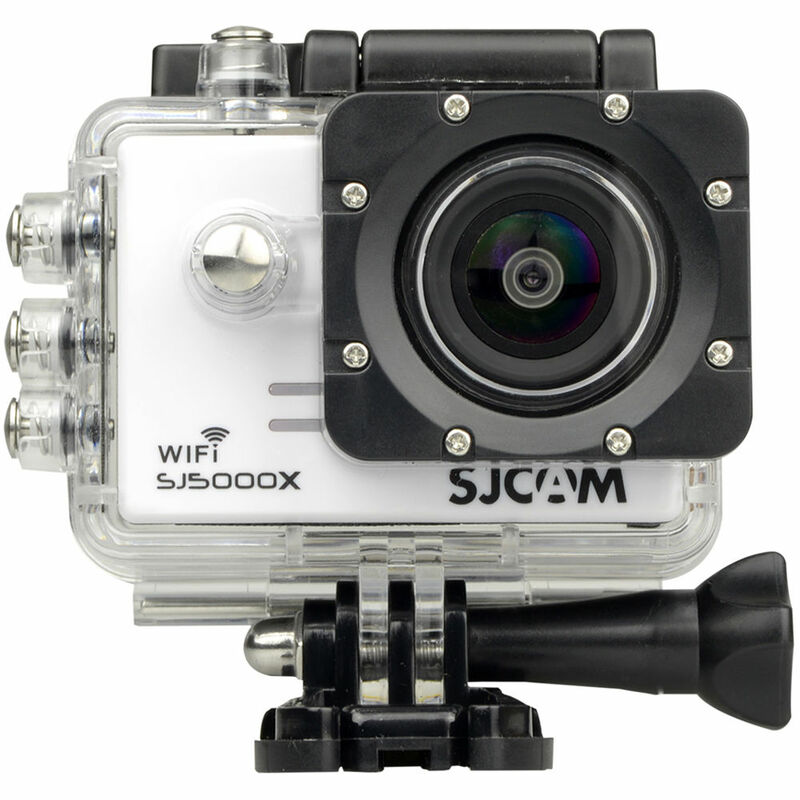 This camera is recommended for those wanting to test the waters for action cameras before investing in a gopro. Rated 5 out of 5 by Bhavik Patel from Just go for it. I would recommend this cam, for the fact that you can use atleast 3 of these for a 1 Go-pro. Having said that ofcorse there are advantages of a Go-pro for the price that you pay. But considering this just out of the box, 1. It is so easy to operate. 2. Quality is good. 3. Good accessories that are provided in the box (including a lens cover and valcro straps.) Down side is, 1. Audio is not hat great and moreover no support for external mic. 2. I was not able to find any Remote accessory for this. Having said that, this is the best you can buy for budget action camera and when you are not a person who has very frequent recordings to be done. Rated 5 out of 5 by Levon D. from Great Camera Really surprised at the quality for this price point. Took it out over the weekend and took some footage and stills of the family. Really impressed by the image quality and footage. 1080p @ 60 turned out great and stills at 10mp where quality as well, wouldn't go any higher than that because of the sensor size. Will be heading to an outside Wedding this weekend and will be trying out the 4K settings (will update later). Overall I've been very impressed and have received amazing reviews and likes from the videos I have and shoot and the stills I have taken. I Highly recommend this lil camera. Rated 5 out of 5 by Fernando D. from Great action camera for the PRICE I was looking for action cameras for a long time. And the Sjcam5000 it was perfect for what I was looking for. I use it for timelapse which is excellent and also for my dog(video) Which the quality is great (1080 ). Only down side is the mic , which is very low when picking up sound . Also another thing is the battery life; it will only last about 40 minute or less so I recommend a portable battery charge. After that you can record for hours no problem. Overall is a great action camera!plus you can buy it and tests it, and return it if no satisfied . Rated 4 out of 5 by Joshua L. from Good video, poor battery I was struck by how amazing the video looks. The color is slightly off but overall the video quality is nice. I've used this mountain biking and the stabilization was awesome. I had this side-by-side with the Sony Action Cam FDR-X1000V and the image was comparable; the SJCAM has a Sony sensor. The battery life is abysmal! I had to recharge after using the camera at 1080P 60fps for 30 minutes. Rated 4 out of 5 by silentsnow from Great alternative to the more expensive brands Bought this because I could get 2 if I wanted for one of the big names. The quality is pretty good, but the colors are still a little off. On a recent snowboard trip, my pants appeared very rich reddish-orange when in reality they are more pink orange (Tiger Lily to be exact). I'm sure I can edit that though. Pretty easy to use and a bunch of mounts included which is nice. The app is lacking and there is no physical remote. The remote is something that I would really like to have. Rated 4 out of 5 by Rich from Video quality great, sound not so much This is a great bargain, if video quality is what your solely looking for. Not true 4k, but it's quality if great for the price, it attaches to the other guys mounts with no issues. Only down side is sound quality is horrible. I knew this when I purchased item, since it was not a concern at all. It does take RAW stills, a super bonus. Web camera function not working, yet. Sure it's just a minor firmware update that is needed. Can view camera on computer live, just web cam interface is non functioning as time I wrote this. does it have time and date stamp? Yes. It is in the Menu&gt;Set Up&gt;Date Stamping&gt; with option to switch it on/off. The UHD 4K resolution video is interpolated from 2880 x 2160. So it shoots a 2.8K frame and then converts the video to a 4K image that can be fully displayed on your 4K TV. Interestingly, 2880 x 2160 is the same resolution the famed Arriflex Alexa digital camera uses when it shoot anamorphic lenses. One of the reviewers mentioned that the camera comes with several accessory mounts. What does it actually come with? I'm buying it for scuba. The SJCAM SJ5000X Elite 4K Action Camera (Black) that we are selling has no reported problems that we know of. Does this only have a wide lens? Or medium and fish-eye too? Does it have night vision? Can this camera save video to memory while streaming to the usb slot at the same time? To save video you have to use Micro SD Card. Answered by: RUI M P.
My WiFi function is not working hiw do I do? I cant connect WiFi is doesnt show WiFi, but is show that connected WiFi but is doesnt show on the icon the corner on my T-Mobile service. Try to reset to the factory default settings: DEFAULT SETTING: Restores the camera unit to its factory setting including WiFi Password. Does not erase any data on the memory card.Also be sure to download the latest firmware:VERSION: Firmware update version. Please check &lt;a href= http://www.support.sjcamhd.com target= _blank &gt;www.support.sjcamhd.com&lt;/a&gt; regularly for newer versions for your camera model.